The above was sent to me by Bob. He says that he "winged it" with these Costumes and I just have to say that I think he winged it WELL! (I'm sure his kids Joshua and Zachary thought so too :-) He was able to give me some brief "how to's" (about the Caterpillar) that I will share with you on my Homemade Costume pages. 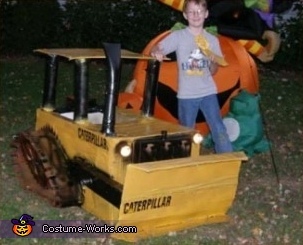 This is a homemade costume for boys.